How to Set Reachable Goals ...Finally! - Look! We're Learning! How to Set Reachable Goals …Finally! How many of you are in the process of setting goals for this year? January is an extremely popular time of year for goal-setting…and February is an extremely popular time of year for giving up on those goals. We all mean well when we set goals to improve our lives, but it’s just so hard to live up to them! And a lot of that has to do with the fact that we’re not setting goals that are actually reachable. I’ve been trying to make serious life changes for years, but 2015 was the first year that I actually stuck to my goals and accomplished them! 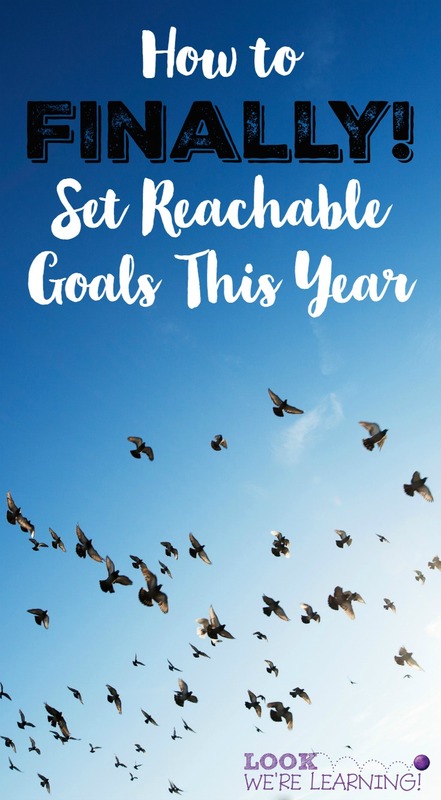 So I want to share a few tips to help you learn how to set reachable goals …finally! What constitutes a reachable goal? Think of the word “reachable”. What comes to mind? For example, I’m a short gal. When I go to the store, I know which objects are within my reach and which are not. There are some things on shelves that I simply cannot get, no matter how high I try to jump. I don’t even bother with those. That’s what Employee Call buttons are for. If it’s something I can possibly get (even if I have to stand on tiptoes), though, then I’ll put forth the effort to get it on my own. And that’s what we have to think about when we’re setting goals. They should items that you can actually reach out and get in a reasonable amount of time. If you’re trying to work on fitness this year, you may be tempted to put down a goal of “lose 50 pounds”. And sure, that might be a reachable goal. But is it something you can accomplish in a reasonable amount of time? Probably not. On the other hand, “run around the block without stopping” is a goal that you can accomplish pretty quickly. So you’re far more likely to reach out and get it! Plus, it’s a stepping-stone goal on the way to losing 50 pounds. Win-win! This year, I’m excited to be joining up with the Monthly Goals Linky! Each month, we’ll be sharing our goals (personal and professional) with you! Let’s make this year the best one yet – together! I’ll be setting one goal for each area of my life: Family, Finances, Wellness, Work, and Home. 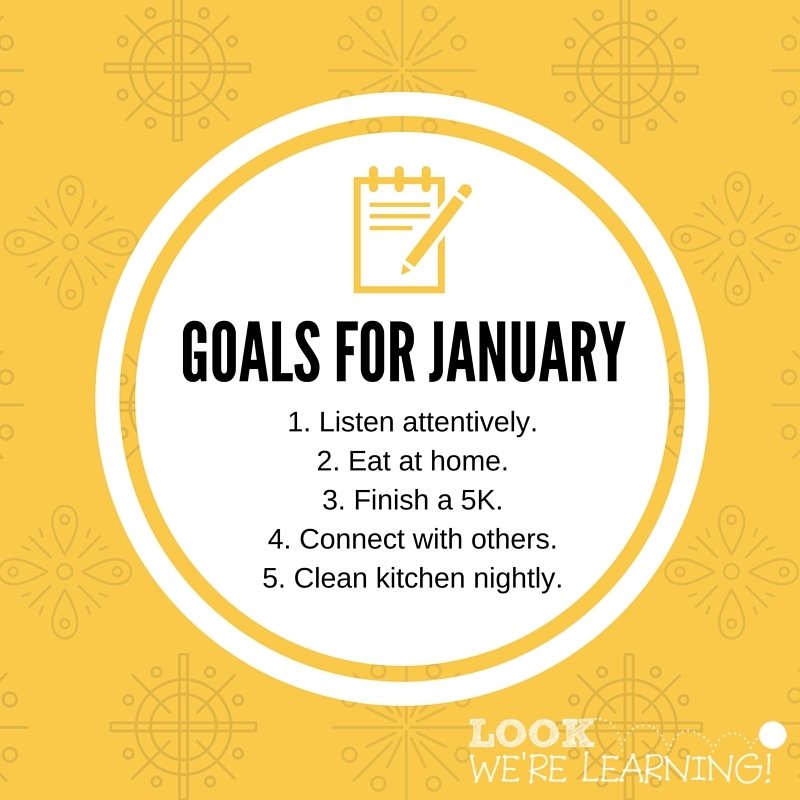 Here are my goals for January 2016! Family Goal: Listen attentively to my husband and my children. Financial Goal: Save money by eating at home. Work Goal: Reach out and connect with my readers (that’s you!) and other bloggers. Are you setting any goals for this year or this month? How do you plan to set reachable goals this time? Please share your thoughts in the comments! Be sure to check out the monthly goals being shared below! And – if you’re a blogger – share your own goals for this month! I’m with you on the clean kitchen! That is one thing I HAVE to do before I go to sleep each night. Love how simple and clear your goals are! I try not to set too many goals. Funny you talked about losing weight: I just put a goal of losing 30+ pounds by May (hah!). I know it is TOTALLY doable since I have a fitness background and have just been lazy /busy /breastfeeding (which in my case doesn’t allow me to lose weight). So it is time to concentrate on clean eating, exercise and sleep (spoken by a blogger writing a comment at 1.30 am! ha ha).